Absolute superb performance by Arsenal playing in one of the hardest places to get a result. Olympiakos will be disappointed with the result but its a massive night for Arsenal and fans will remember it for a long time to come. Arsenal needed to win by a at least 2 goals against Olympiakos to stand a chance to qualify for the knockout stages of champions league. Arsenal started the game pretty average but got a goal at the stroke of half hour mark through Olivier Giroud and he was on target again early in second half to give Arsenal 2-0 lead which they need to qualify for the knockouts. Olivier Giroud completed his hattrick with a well taken penalty and guided Arsenal to next round. Arsenal lost earlier game between the two sides back in September when Olympiakos produced one of their greatest performances in champions league at Emirates Stadium. Olympiakos took the lead three times in the game after opening the scoring. 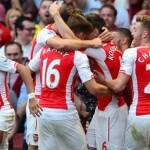 Will that defeat comeback to haunt Arsenal’s chances of qualification to knockouts ? We will know this wednesday night, 09 december 2015. The game will be played on Wednesday, 09 December 2015 and we will have live streams right here on this page. Below is the summary from September 2015 encounter between the two sides where Olympiakos won the game with in a dramatic fashion at Emirates Stadium in London. Arsenal vs Olympiakos Preview & Team News: Olympiakos are regular Champions League team who have won their domestic league 5 times in a row and currently they are on a winning streak in the league. They will pose a threat for Arsenal even at the Emirates Stadium but Arsenal should be well prepared to cope with it having won 2 back to back games last week. First against Tottenham in the Capital One Cup and than of course in the league againt Leicester City by 5-2. Francis Coqueli will return to starting lineup for the game against Olympiakos but Flamini and Arteta both set to miss alongside long-term injuries of Danny Welbeck and Wilshere. Gabriel will be available as he was suspended for domsetic 1 match. Arsenal are likely to start with Walcott, Sanchez and Giroud upfront with Ozil, Cazorla and Coqueli in central midfield roles. 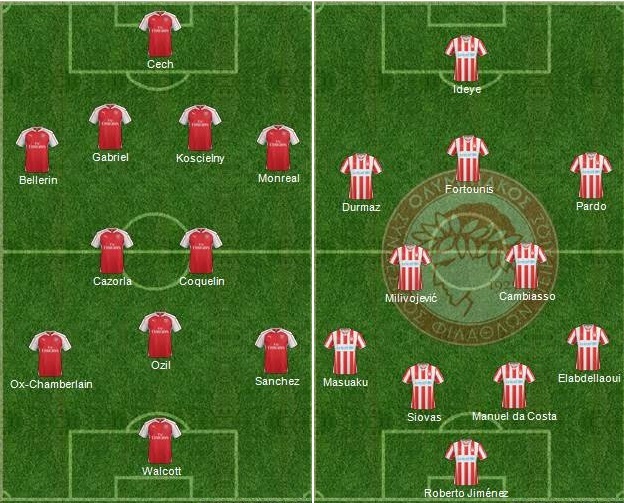 This is how I expect both teams to lineup going into the tuesday night football. There is a toss between Giroud and Walcott but there should not be any surprise rest of the field. Predictions: Arsenal should be favourite playing at home but all English teams have been struggling in europe for last few years and these foreign teams know how to frustrate english clubs. Olympiakos are no pushovers and they will pose a threat on counter but I just think Arsenal having won 5-2 against Leicester will be confident and bold enough to breakdown Olympiakos defense and register their first european win.